Many plants are beautiful, but sculpted trees and shrubs can in many cases be considered works of art. Oregon growers are increasingly doing more and more creative things with junipers, pines, boxwoods, Chamaecyparis and many others. 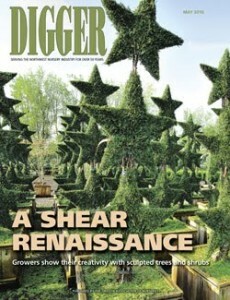 Curt Kipp takes a look in this article (PDF) from the May 2010 issue of Digger.